The new, high-flow exhaust system has a longer head-pipe, tapered mid-section, and multi-layer silencer that has better flow through the entire rev range, with an emphasis on low-rpm performance. Suzuki's proven, easy-to-use fuel couplers are included to simplify EFI tuning.- For quick fuel adjustments to suit riding conditions, two couplers are provided. One is for a richer-than-stock and another for a leaner-than-stock fuel setting. Riders can change fuel settings in seconds by simply connecting either coupler to the wire harness. The 2019 RM-Z250 features an evolved and faster traction management system. The Electronic Control Module (ECM) continually measures throttle opening, engine speed, and gear position, and then adjusts the ignition timing and fuel injector duration to fine-tune the engine output to deliver the best traction for the riding conditions.- The RM-Z250's traction management system is different from a street bike traction control system, as it does not measure rear tire spin. Because the needs of a motocrosser are different than a street bike, this system offers constant adjustment that maximizes traction at all times. The Suzuki Holeshot Assist Control (S-HAC) is a selectable launch system derived from the factory race bike to help riders' takeoff from the starting gate for an early lead.- To aid riders at the moment of launch, there are three stages of power adjustment from the S-HAC system: 1) the moment of initial launch, 2) when crossing the starting gate, and 3) acceleration up to full-speed. There are three S-HAC modes riders can choose for the best option per their skill level and starting conditions. The S-HAC settings for both launch modes on the 2019 RM-Z250 are updated to help the rider control engine speed during starts.A-Mode: For hard surfaces or slippery conditions at the starting gate. In this mode, S-HAC alters ignition timing at the moment of launch and the ride over the gate to reduce wheel slip to deliver a smooth takeoff. It also advances ignition timing during this sequence for stronger acceleration. After six seconds or when you reach fourth gear, the system shuts off and returns to normal ignition timing.- Benefit of A-Mode: For novice riders, and/or hard and slippery traction conditions, use A-Mode for a more controlled launch.B-Mode: When conditions at the starting gate have better traction, and a more aggressive launch is desired. S-HAC will advance the ignition timing to allow increased throttle response and stronger acceleration off the line. The ignition timing alternation is in a similar sequence as A-Mode, but with increased overall timing. One of three conditions will return the ignition to normal operation (whichever happens first): After six seconds or when you reach fourth gear, the system shuts off and returns to normal ignition timing.- Benefit of B-Mode: For skilled riders, and/or good starting conditions, use B-Mode for a more aggressive launch.Base Mode: Standard power launch, no action required on the S-HAC switch. The five-speed transmission is updated with a new second gear ratio and overall final ratio to match the engine's stronger output for better acceleration and top speed. 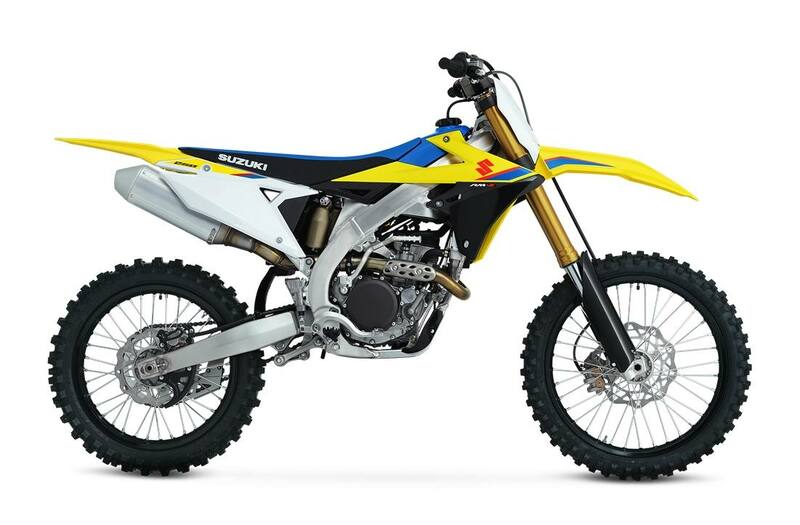 The 2019 RM-Z250 features a new frame and swingarm design that continues Suzuki's reputation for creating the best-handling motocross motorcycles. The new frame is 370 grams (0.8 pounds) lighter but has a 10 percent increase in torsional rigidity. The position of the engine in the new frame is changed so the crankshaft sits higher in the chassis to further the bike's nimble handling characteristics. The new hydroforming process enabled engineers to create tapered swingarm beams that increased rigidity, while reducing heavier assembly welding. New hexagonal aluminum rails are used on the sub-frame for lighter weight, a slimmer appearance, and easier air filter access. Not only is the new sub-frame narrow, but all of the body work is slim, so the rider can move freely in the cockpit, especially during spirited riding. The new, KYB-supplied shock absorber has a thin-wire spring, spring guide, cushion rubber guide, and lower link that weigh less and have better movement reaction. The new spring and link weigh a pound (447.5 grams) less than the prior parts. This KYB shock has new damping force circuits and a different rear lever ratio to improve the suspension's traction characteristics. The damping force adjusters have a wider tuning range, so the settings can better match the conditions and the rider's style. This new fork uses a free-piston design that separates air and oil to optimize the damping characteristics. Other internal changes help control the damping cartridge's pressure and spring recoil, so the fork action remains supple and precise. A new design rear brake master cylinder hugs the frame beam to reduce dirt contamination and the chance of the rider's boot touching it during riding. Suzuki beak-inspired styling has a sharp front fender and radiator shroud shapes that blend into the frame's side covers and an upswept tail, to promote the impression of speed while reducing weight and easing service. The functional styling and the motorcycle's trim chassis permits a variety of rider positions that facilitate control and comfort. In addition to the ergonomic improvements from the new bodywork, the rider's foot pegs are moved 0.12 inches (3.3 mm) forward and 0.2 inches (5.2 mm) upward, while the handlebar grip position is moved 0.3 inches (7.4 mm) forward and 0.15 inches (3.8 mm) downward, to create a high level of rider-control during competition. The new plastic fuel tank weighs a half-pound less than the prior model's aluminum tank. Fuel capacity is 1.6 US gallons. The new, slimmer seat has revised foam density to aid the rider's control of the motorcycle. The seat weighs a half-pound less than the prior model's and has a large gripper panel that runs nose-to-tail on the cover.